I’m obsessed with the journal I got at Barnes & Noble. They have a huge selection and I really spent a lot of time looking for the right one. I’m always picky when it comes to school planners, notebooks and those types of things. I thought at first to go with a small leather European looking notebook, then maybe one with inspirational quotes, but when I saw this one I fell in love with it! It has a ton of world maps inside, along with both monthly and weekly planners, a space to write and then tons of blank pages for drawings. There’s also a little pocket in the back to keep some scraps of things found! It’s small and cute and will fit right in my satchel. 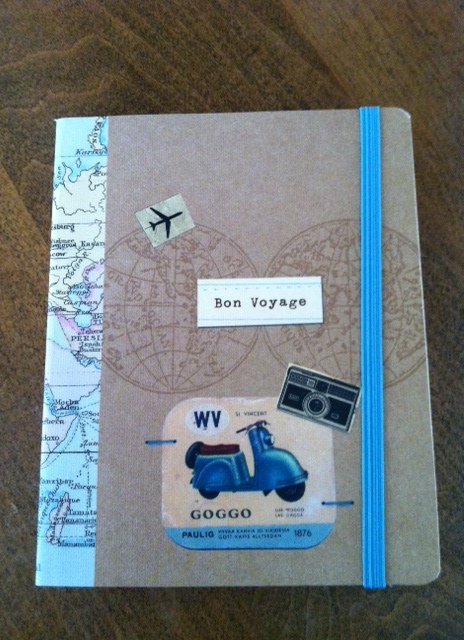 I bought this journal at B&N for $14.99 but you can also order it online from the Galison website here. This entry was posted in Preparing, Travel and tagged abroad, blogging, documenting, florence, italy, journal, travel, writing. Bookmark the permalink. I just LOVE your blog so far. I’m gonna read it every single day so i can stay up to date with all the fun activities you do!! !